US, 1960, 193 minutes, Colour. John Wayne, Richard Widmark, Laurence Harvey, Richard Boone, Fabian, Pat Wayne, Linda Cristal. 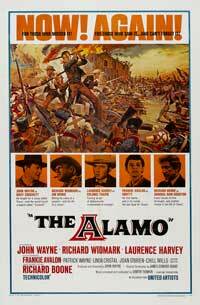 The Alamo is a big long western, in praise of the famous defeat which paved the way for Texas becoming an American state out of the power of Mexico. Frank Lloyd had made The Last Command in 1955. John Wayne produced and directed this mammoth epic which made a great impression in 1960. It is interesting to note that 1960 was an important electoral year, the Kennedy-Nixon? clash. John Wayne gives some dignity to Davy Crockett and doesn't emphasise the 'backwoodsman' background. Richard Widmark is a severe Jim Bowie. Laurence Harvey is very adept at 'honourable Southern gentlemen'. The film is quite colourful and spectacular, with an attractive Dmitri Tiomkin score and a savage climax. An interesting example of John Wayne's American patriotism of the '50s and '60s. The only other film Wayne was to direct was his Vietnam story, the hawklike The Green Berets (1968) . 1. The impact of this western? Its size and length? Grand style? The hand of John Wayne as director, his presence as actor? Its scope? 2. Audience knowledge of and appreciation of the history of the Alamo and Texas? The significance of its being an American defeat, the glory and the consequences? Morale boosting? The relationship of Mexico, the United States. the forming of such states as Texas? What light did the film thrown on this historical background, what emphasis to morale boosting? 3. The film was released in 1960, the atmosphere of the elections, patriotism and the status of America at that time? John Wayne's political background and his contribution at that time? 4. The use of colour, wide screen? The western locations? The importance of the music and the use of the songs and themes? 5. The background of the Mexican situation, the tyranny of Santa Ana and its extinction into Texas? Political considerations of Texas and Mexico, trade considerations? The status of the various families and their freedoms? Loyalties? The violence inherent in such a situation? How well was this visualised at the beginning of the film? 6. The presentation of the fort and the town? Its place in the strategy of General Houston? The people in the town, the pressures on them~ their attitude towards defence, aggression? 7. The presentation of General Houston, his style? His place in American history? The film's treatment of him as an important person in their history? His personality, relationship with Bowie? The importance of his strategy and the way that this was explained, its failure? Success in the repercussions? 8. The film's focus on Travis as a Southern gentleman? The emphasis on the South, his background and style as a gentleman? His emphasis on form and decorum? His stubbornness? The inevitability of his clash with Bowie? His meeting with Crockett and being impressed by him? His pleas for the holding of the fort, his hold over Bowie and Crockett? The bases on which he made his decisions? His death as a Southern gentleman? 9. The contrast with Jim Bowie ? his reputation in American folklore? His place in Texas, as a Texas man with his wealth and property? His drinking, anger? His continual clashes with Travis in personality, strategy? His relationship with his men, his decisions? His relationship with Crockett? The significance and emotive impact of his wife's death. the news, Travis' insensitivity and clash and Travis' backing down? The heroism of his death? 10. John Wayne as Davy Crockett? The importance of his pioneering background, his political career, the loyalty of his men? The drama of his arrival? His folksy style, for instance at the dance and yet his shrewdness? The importance of the romantic interlude? His contriving of the letter from Santa Ana and its repercussions? His role as a leader, influence, leading his men? His death and the explosion? Iris place in American folklore? 11. The portrait of the various men, especially Travis' assistant and the advice that he gave, the various personalities in Crockett's team, the young man and his singing? The loyalties of such men? 12. The presentation of the Mexicans, life in the village, the mayor and his authority? 13. The place of women in this film? The loyal wives, the harassment of the siege, their children? Romantic interludes and their appropriateness in this film? The wives surviving? 14. Comment on the impact of the battle sequences, the style in which they were filmed, vividness? Such interludes as Bowie's blowing up of the cannon? The importance of the final siege and the wave of Santa Ana’s men, the people in the fort being outnumbered? The dramatic impact of the salute to the women? 15. The success of the film as a western, action adventure, piece of Americana and American history?